Most people are searching for ways to "go green" nowadays. From water bottles made from plants, to old tires becoming development materials, businesses everywhere are marketing "green". All of this talk of carbon footprints and global warming has successfully made its way into the everyday vernacular and left homeowners evaluating their own impact. Their are a number of gimmicks around to maximize your electricity efficiency and reduced your power bills, but most of them just pray on an increasingly energy conscious public. Doing work in the weatherization field I frequently get questioned for advice on cutting back on utilities and making a home more energy-efficient. I usually respond by telling the homeowner to adhere to some basic steps: shut off lights that are not being used, and then get a programmable thermostat assuming they don't curently have one. If they need to do more however, I let them know that one of the greatest returns on investment for virtually any house is raising the efficiency of their forced-air heating and air conditioning system. Typical cooling and heating systems may be over 20 % inefficient. These inefficiencies signify that for each and every five dollars in paying to heat or cool your home, a dollar has been thrown away trying to condition your attic or unfinished basement. For those who spend $2000 dollars per year on heating and air conditioning utilities it's a waste of $400! That's money you're wasting and greenhouse gases which are being produced without real gain. Give it some thought, the less energy-efficient your house, the more you undoubtedly pay to pollute our environment. By sealing and insulating your ducts you could dramatically boost your systems efficiency. Improperly sealed ducts can dump your conditioned air (air that's the humidity and temperature you prefer) back into the non-conditioned areas the ducts are running through. It's efficiency lost! Additionally, non-sealed return ducts will in fact pull the non-conditioned air surrounding them into your ducts causing your system to have to work much harder to maintain your house for the desired humidity and temperature. Certain house appliances for example hot water heaters and furnaces may also emit dangerous gases like deadly carbon monoxide which could then be drawn in to the ducts through leaky return ducts. Not insulating your ducts is actually as bad as not insulating your home. Not only does insulating your ducts reduce condensation which can cause moisture problems and toxic mold, but it also assists in keeping the air within the duct the proper temperature. Consider this, if your ducts are carrying 72 degree air yet the ducts are the same temperature as a basement, say 50 degrees, this is a 20 degree temperature battle taking place from your furnace till the air makes its way out into your livable areas of your home. Duct sealing and insulation is inexpensive as a do-it-yourself project. When you understand what to find and where you should go, you may easily do-it-yourself throughout the course of a few weekends. You don't have to shut off your furnace or air conditioning system to insulate and seal the ducts. Obviously, I normally recommend getting a professional get it done if you aren't very technically inclined, however this is among the safer DIY projects. In either case with all the expense of energy increasing this can be a great project for you to do and also to realize an incredibly quick return-on-investment. I own Aeroseal Duct Sealing Calgary. We are brand new to Western Canada but this product has been around for over 15 years. We are the only nondestructive method of fully sealing your system from the furnace to the supply and the return back to the furnace. See www.aerosealcalgary.com. 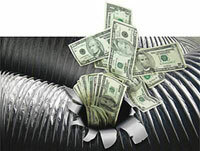 I never expected that there are actually plenty of companies in this area that offer this kind of duct sealing service. I have come across this post and found here a great post about insulation, insulation is really a crucial thing for homes, it keeps our home warm in winters and cool in summer, so we can say insulation is an energy efficient technique. We can reduce our electricity bills that we waste on heating and cooling machines. Click here for read more on insulation.